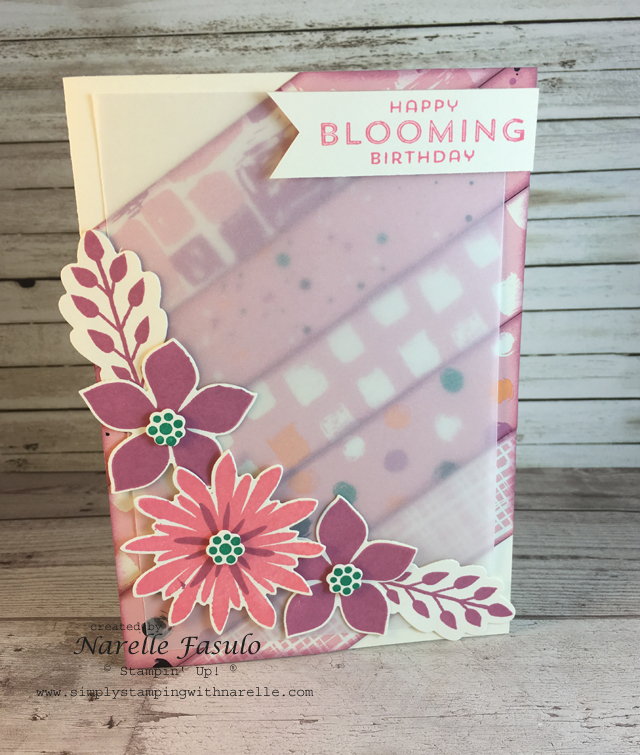 Yesterday as part of the Freshly Brewed Projects I showed you a card using the Painter's Palette stamp set. But did you know that it is part of a bigger product suite. 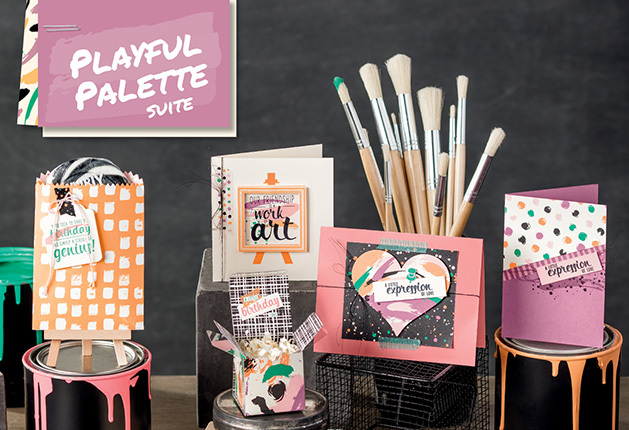 The Playful Palette Suite. Another item in the suite is the Playful Palette Designer Series Paper Stack. This paper stack is just wonderful. And a very handy 6" x 6". So you can do more than just card fronts with it. I must say when I first saw this paper I was a bit taken aback because it seemed so bright and bold. But the more I have used it, the more I have grown to love it. And if you really can't get over the bold patterns, there is always the reverse side which is much tamer. The card I did today is a very subtle card. Even though I love the paper, I still wanted to mute it more. So I added a layer of vellum on top which added some softness. I also wanted to show off several of the designs in the pack, so went for a design that allowed me to do just that. All I simply did was cut 1" strips of several of the papers. Sponged around each in Sweet Sugarplum. Then glued them on at an angle. I trimmed the excess and then completed the sponging on the cut edges. I adhered the vellum in the top right and bottom left corners. I knew I was putting elements in those two places, so the glue would not show. We have so many beautiful new flower options in the new catalogue, but I wanted to highlight a stamp set that has been around for a little while and probably overlooked by now. Flower Patch. I love this set as you can do so much with it. A change of colours and you have a whole new look. Before you go, I just wanted to ask you, do you want FREE stamps? You do !! Of course you do. Then all you need to do is to purchase the Starter Kit in June and you will get TWO FREE stamp sets, of your choice. Click on the graphic below to get started.